Every employer wants the best talent. But most recruiters still don’t know how to attract them. So how do we find our perfect match? The War for Talent was a concept first created by Steven Hankin in 1997 to refer to the challenge of targeting the perfect job candidate. 21 years have passed and many companies are still trying to find the ideal business strategy when recruiting. In today’s digital world, technologies shorten distances and expanded our horizons, but talent management has become more complex. The main reason for this is because today’s workforce has higher expectations and demands. 21 years ago, the main focus was a good wage for a good job. Today, however, people look for a wider range of benefits: work-life balance, self-development, productivity and, obviously, good wages. Also, the future of the workforce will also demand new and more sophisticated skills. The name War for Talent is not in vain, as companies need to establish long-term strategies to divert competition and strike the challenge of hiring. If companies want a star in the workforce Hall of Fame, they need to readapt to the modern War for Talent. 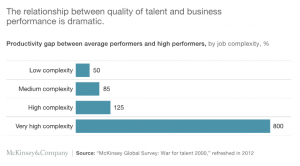 Superior talent is revealed by McKinsey to be eight times more productive and the impact in business performance is dramatic. Also, the gap is increased with the job’s complexity. For higher occupations, the percentage boosts up to 800%. In addition, with high-level talents companies are able to reach their business goals way faster. While the phrase War for Talent originally signified how companies can attract the best candidates, the concept has broadened its meaning today. It has to work both ways. There’s no point looking for the best CV if the candidate’s career ambition doesn’t match with the offered opportunity. As recruiters, we should evaluate what motivates people to excel in their work environment. It’s time to recognize that talent is valuable, profitable and hard to find. While superior talent is proven to be up to 400% more productive, global CEOs recently pointed out that: “failure to attract and retain top talent” is their number one issue. It’s a war far from over. Another report by McKinsey Global Institute indicated that 1 million current jobs will be lost to automation by 2026. In response, hundreds of millions of new jobs will be created. It is a prediction that will affect job seekers and, consequently, job recruiters. Jobs will become more complex as technology will require new and more sophisticated skills. Assuming that CEOs and business leaders are aware that high talent is scarce, you think they would know where to find it, right? 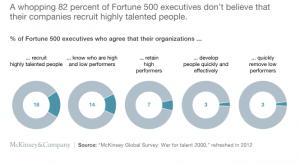 McKinsey also revealed that business leaders just aren’t good with hiring. 82% of companies don’t believe they recruit talented people. If they do, only 7% of them think they will be able to keep them. And it doesn’t stop there. 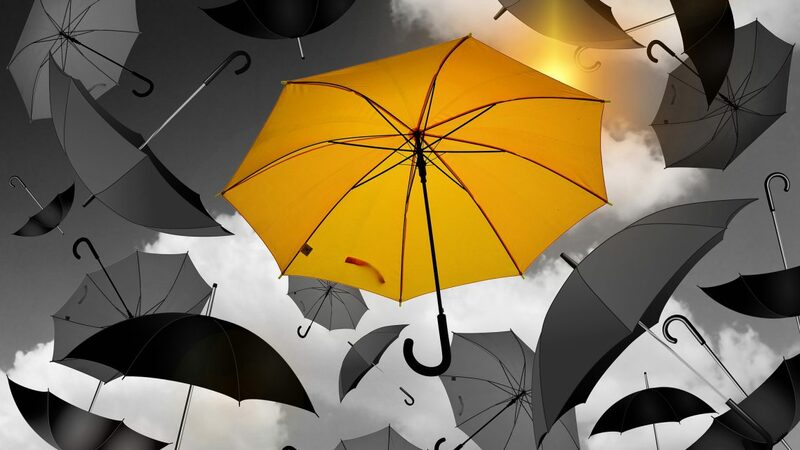 Only 14% of respondents affirmed they know how to distinguish low and high performers. All the changes to the future of work we have mentioned are slowly taking place and we need to be ready for them. For example, millennials and Generation Z have a completely different posture with their employers than Baby Boomers. The Bureau of Labor Statistics estimates that workers stay at their job for 4.4 years on average and for the youngest workers the average drops to about 2.2. Let’s face facts. Changes are coming and we need to embrace them if we ever want to reap the benefits. This scenario might be challenging but it is an opportunity to review our strategies so they can work in our favour. The challenge here is not to find the perfect candidate; instead, it’s about refining the talents that want you as much as you want them. Therefore, you will have a productive high-talent that believes in your work and will be happy to stay and contribute to your business. At Abodoo, we have the perfect win-win strategy. Our smart platform uses a sophisticated algorithm that will match the perfect candidate based solely on an employer’s requirements. Candidates are chosen fairly by their skills rather than their geographic location or personal information. With a SmartWorking strategy, you have a larger and more flexible pool of candidates and can ensure you’re hiring process is free of potential biases. If you want to lead the charge in a highly competitive industry, why not register with Abodoo to find the best talent for you.